WHO CAN STAND: As-Good-As-Lasagna Eggplant Parmesan! 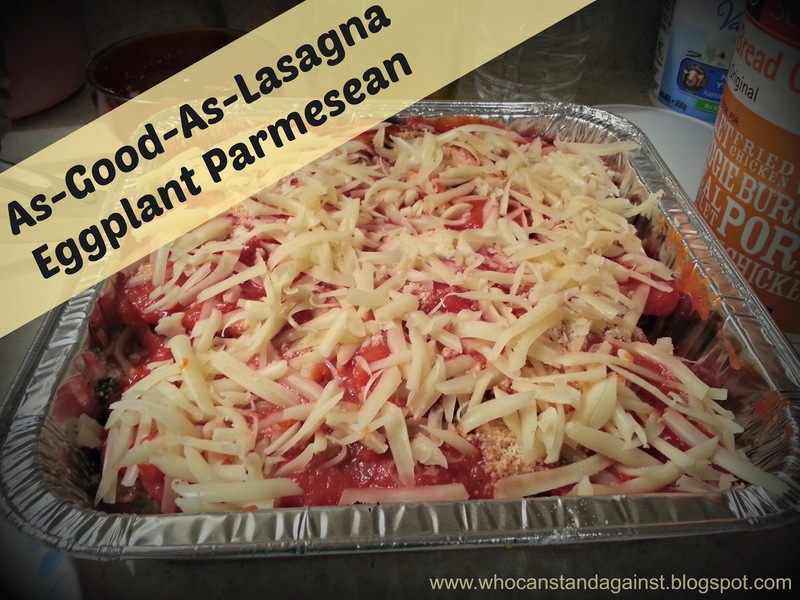 During the summer, my mother-in-law's garden was overflowing with eggplant and one evening she decided to make Eggplant Parmesan. We couldn't BELIEVE how good it was. Thanks to her generosity, and it being my new favourite meal, we had it quite a bit throughout the late summer and into the fall. It's a great recipe to make if you have a vegetarian friend coming over, OR if you just want a delicious meal! We always ate ours right away, but apparently they do freeze well. Slice the eggplant lengthwise (so you have long strips, not circular pieces). Try to slice them pretty thin. Dip a slice in flour, then whisked eggs, then bread crumbs. Fry about 4 minutes each side. You want them to be fairly soft after this. (You can bake them for a healthier option). I continued to do the above with all the eggplants while I assembled the casserole as described below. Then repeat: a layer of eggplant pieces, tomato sauce on top, sprinkle Parmesan and mozzarella (I think I did three layers). I ended with the cheese but did more mozzarella on the very top than I had inbetween layers. I didn't layer the eggplant pieces in the same place, which you could do if you wanted to be able to take out a single eggplant portion. I figured I would try and make more of a solid eggplant casserole and cut it into servings, which seemed to work. Bake it for around 30 minutes at 350F. I then broiled it a couple minutes at the end to get the cheese a little crispy.